It’s funny how you get used to things and take them for granted isn’t it? I was brought up in Cornwall and spent many a happy hour as a youngster, sitting on the beach with friends and family. I left to go to Uni and haven’t lived there since but visit several times a year. Each time I pop down, I think it’s more and more beautiful. The rugged coastline, the cobbled streets, the wonky seaside houses lining up side by side all weathered by the fresh salt air. Now known more as Poldark and Doc Martin land with visitors queuing to take a snapshot of the local sights and wealthy city folk buying holiday homes that are then done up to the nines and empty for most of the year. How times change things! This pretty (but always windy) little village is called Charlestown (Photo credit- RSBP). During my teens I had a job waitressing in the building on the left- The Pier House Hotel. My doting dad would park up outside at midnight and sometimes wait until I appeared at 2 am. Not the most glamorous job but needs must when you’re 17 and want to buy trendy clothes (albeit flared jeans and afghan coats!). Many years later, as I sit in my garden studio I often think of those times. So on the odd occasion, I grab a few selfish hours, and throw a few bits of fabric and embroidery stitches together, to remind me of happy times gone by. The following photos show how I work through that process. This piece was made a couple of years ago but still gives me that warm feeling of nostalgia when I look at it. I can smell the pasties and hear the seagulls in the distance. The background fabric is a substantial cotton, roughly A4 in size. I rarely use a hoop when machine embroidering so need a sturdy piece of fabric. 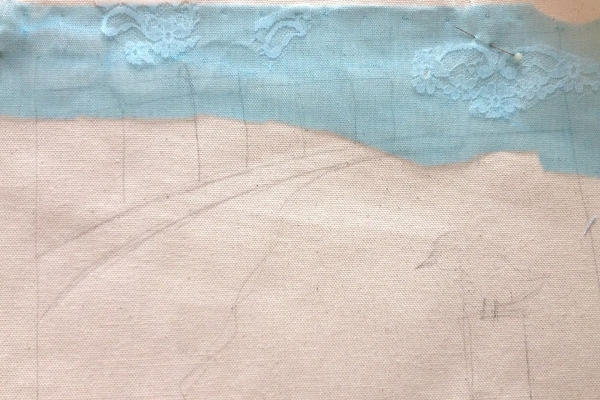 The clouds are cut from lace and hidden behind a sky of blue organza. I use a lot of organza in all my work. You can get great effects from layering with different colours and they give a soft focus look. 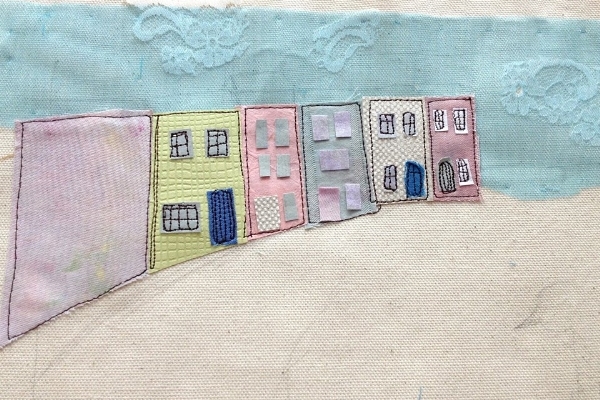 In the next stage, I have added the houses- all made of paper. I stitch paper in exactly the same way as I would stitch fabric except that the stitches are slightly bigger so that prevents the paper from searing along the stitched line. The lines here are not particularly straight, but neither are the houses in real life, so I don’t mind. The windows are also paper and have been roughly attached with a glue stick before stitching- not too much or the needle will get clogged up. 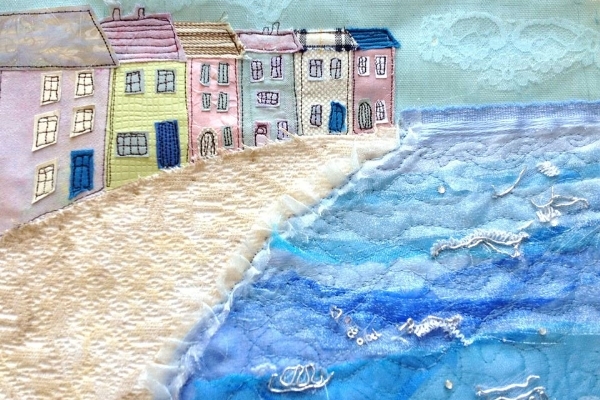 The roofs and pier were added first, then the sea. I have used random strips of anything blue- cottons underneath and organza on top- there would be no point in putting the cottons on top of the organza, but the cottons should show through. I have cut irregular lengths of fabric and stitched them in place quickly as I worked- twisting and pulling the pieces as I went. All I have used is a straight stitch, but have pulled the fabric in different directions and made a few stitched swirls here and there. Then finally, added some hand stitched bits of bling- this is an Asian sari fabric cut up. It doesn’t need a lot to catch and shimmer in the light. 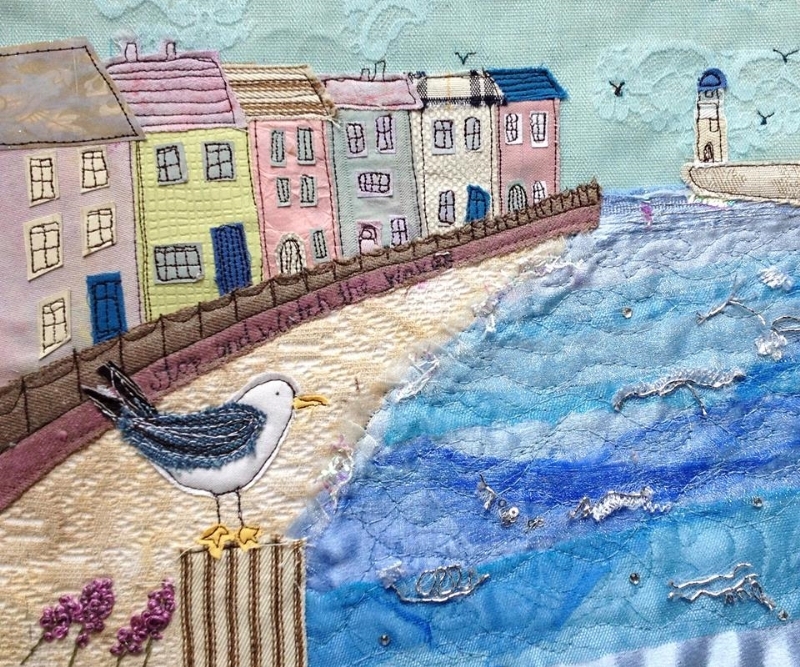 Finally, with a few hand stitched pieces of lavender on the left and a cheerful nosy seagull looking at the lighthouse in the distance, I feel my time here is done. You can overdo pieces and sometimes simple is good. You’ll have noticed that I changed my mind on the position of the seagull- perhaps I should have stuck with the original plan- he would have shown up more. I hope you like my Cornish tribute. I’ve stitched with an artistic licence, it isn’t meant to be realistic. Just a bit of fun and hopefully will make others smile when they look at it. Happy times by the sea.